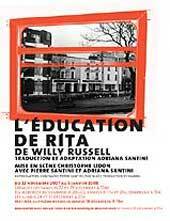 Most people will know Willy Russell's award-winning play Educating Rita from the hit 1983 film version starring big screen legend Sir Michael Caine and much-loved small screen star Julie Walters. The comedy drama captured the hearts of the nation with its tale of a working-class woman determined to better herself through education arriving at the door of a bored university tutor. When Rita bursts into the office of Frank Bryant, keen to learn about ‘everythin’, neither she nor Frank can anticipate the impact of their encounter. 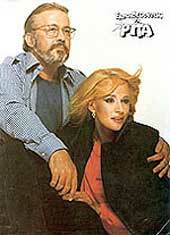 The consequent changes they undergo, and the lessons they both learn, make for a witty and heartfelt story. Frank has almost given up on his ambition to be a poet and bored of teaching undergraduate English students, he reflects morosely on his life. That is until Rita walks in. A 26 year old, married hairdresser, Rita has decided to take control of her life and earn herself an education. With Rita’s brash honesty and Frank’s deep intellect, each inspires the other as they both begin to wake up to life in their own way. The award-winning film was also nominated for three Oscars, so no pressure then on lead actors David Birrell (Best Actor in a Supporting Role Manchester Theatre Awards 2015 Best Actor in a Supporting Role Manchester Theatre Awards 2016) and local girl Jessica Baglow (ex-Bolton School) who has many Octagon appearances under her belt including roles in An Inspector calls, Hobson's Choice, Twelfth Night, Noises Off and The Family Way as well as TV and film appearances including Holby City, Emmerdale, Where the Heart is and Waterloo Road. And the pair pull it off with aplomb, it is no exaggeration to say that there were constant flashes of Ms Walters about Jessica's performance while I think Mr Birrell would have won tremendous applause from the great Sir Michael himself. And tremendous applause was the order of the day when, after two hours of intense dialogue peppered with humour and pathos, the only two cast members took an extended bow before a very appreciative very nearly full house. Aside from an incongruous mix of props such as a laptop, 35mm slide projector and a paper model of Shakespeare’s Globe, as well as a few subtle script changes, there is little to fault in Sonning’s production of Educating Rita. Realistically, the play could be set in almost any decade anyway, as the storyline resonates with a timeless message about the quest for self-improvement. Credit lies with Willy Russell and his intelligent script. Stuart Fox and Laura Doddington find themselves successfully filling the large shoes of various skilled actors who have played the roles of Frank and Rita before. They both rise to the challenge admirably, instilling their own originality into the well-drawn roles. Robin Herford directs with animation to ensure that the audience appreciates each scene as a development in both time and in Rita’s metaphorical journey. Fox encapsulates the life of the alcoholic academic with an intellectual weariness above which he rises to teach Rita against his better judgement. 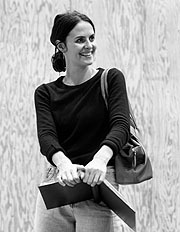 Doddington captures Rita’s nervous energy - she is effervescent and enthusiastic and, above all, shows the character’s determination to succeed. The Mill has a very strong production on offer and one which is hugely entertaining and tantalisingly poignant. It's surprising that even now, in a world where digital technology fills every minute of every day, a play written more than 30 years ago can still be relevant. But Willy Russell's two-man show, Educating Rita, has stood the test of time and can still make audiences truly believe in the characters. 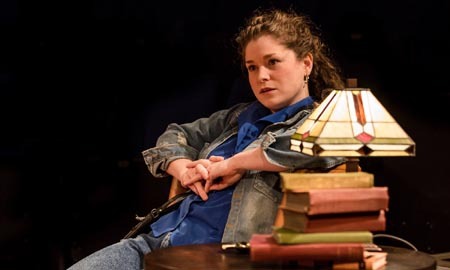 The Mill at Sonning’s production tells the story of Rita (Laura Doddington), a 26-year-old hairdresser from Liverpool, whose husband wants her to settle down and have a baby. But she doesn't want to do that until she has a choice, meaning she needs to give herself something else to live for. Having worked out that you didn't make friends at school by studying but by "copping off" and buying new dresses Rita doesn't have very many options. But she is hungry to know more about the world and to be able to understand what poetry, opera and ballet is all about. On the flip side Frank (Stuart Fox), a bored and alcoholic university lecturer, is fed up. Having spent his life studying and teaching the work of great poets and authors he's run out of things to live for. He knows too much, he's jaded and he can't really be bothered with anything anymore. The Mill's casting is spot on. Doddington plays Rita with a real passion and thirst, she's excitable and likeable and every inch the endearing student, working through the foot-in-the-mouth moments without exaggerating a single moment. Throughout the play she grows up, blossoming from a brash, uneducated wife to someone with brains and ambition who wants to live for herself, not anyone else. And it's easy to see the transformation which Doddington plays out with subtlety and without losing the audiences fondness of her. Stuart Fox's Frank takes a while to come to love, he's dry and witty but he's also gruff and negative. However, the way Rita excites him turns him into a lovable rogue with whom the audience comes to cheer on - I could almost feel the people around me tensing up with disappointment as he took to the bottle yet again. We want him to find what he's been searching for and we want him to be a better person. The simple costume changes, masterminded by Jane Kidd, ease the audience through the progression of time over an academic year. While Michael Holt's set design inside Frank's office tells the audience exactly what kind of person the lecturer is - worldly and wise but chaotic and ruffled. The best thing about Educating Rita is it teaches its audience, it's full of lessons from the difference between a tragedy and something that's tragic to how to cast traditions aside and live life to the fullest, but it's also charming and unpretentious. Educating Rita is running until mid-March so there are plenty of opportunities to go and see it and lots of reasons why you shouldn't miss it. There are a handful of tales from the last few decades that belong to British culture so much their very titles are shorthand for the stuff we care about. Shirley Valentine was one, Educating Rita another. Everyone knows the Oscar-winning film which made Julie Walters into a world star, so when it was programmed by the Garrick Rep Company I wondered whether it might not be cooking your cabbage twice to revive the original stage play. I needn’t have worried. The result is a triumph, and the programming now seems inspired. 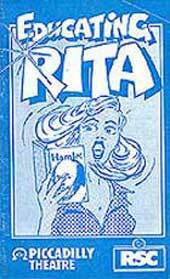 Because this isn’t just Rita’s story. Somehow it’s the story of the empowerment of people in post-war Britain via a revolution in education which opened up opportunities previously reserved only for the well-born. Tupele Dorgu, well-known to Corrie fans as feisty Kelly Crabtree seizes the role of the unsophisticated Rita and gives it a shake until the very theatre rattles. In her extremely capable hands Rita’s experience scoops the audience up and whirls them along with her on a journey of joyous self-discovery. Judging by the audience on the night I went this play appeals very strongly to the ladies, but there’s plenty for us chaps too. 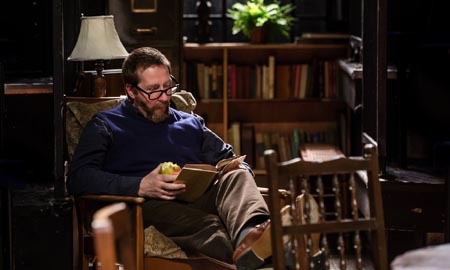 Garrick Rep actor-in-residence Tom Roberts is marvellous as ex-poet and burnt-out academic Frank whose world-weariness is so challenged by Rita’s hunger for learning and the hurdles she has to clear to get it that he too is forced out of his comfort zone and has to move on. Gareth Tudor Price’s direction reveals that Willy Russell’s original play is a modern masterpiece. The spontaneous applause after each beautifully-crafted scene said this more than any words can. Add in John Brookings subtly realistic set and the excellent production values all round and you have a seamless hit that can’t be faulted. Definitely not to be missed. Brilliantly acted and considerately staged, the Watermill’s production of Educating Rita awakens the audience like a rush of fresh air from an open door on a crisp clear winter day. It is funny, thought-provoking and so fastly paced from the start that the audience hardly has time to draw breath. Tim Bentinck as Frank is perfect as the alcoholic professor who fights his conscience, not only on a sexual plane but more significantly on an academic level. 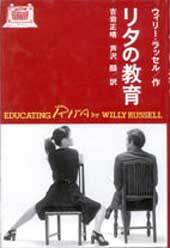 As he tries to balance the value of Rita’s education against her naïve uniqueness, his crucial realisation that her personality is being quashed by her thirst for knowledge is both pathetic and poignant. Claire Lams as Rita gushes onstage with words tumbling out of her mouth in a fine Liverpudlian accent and hardly seems to come up for air. She is excellent in her characterisation, with brilliant timing, and she strongly controls the emotional development of the role. Her invigorating performance sits comfortably on the shelf alongside the many recognised actresses who have played Rita over the years. Set design by Andrew D Edwards creates an accurate account of organised chaos. The cast’s dialect coach is Joan Washington and Jamie Glover’s direction is generally faultless. It's difficult to do Educating Rita badly. The 80 minutes crackle away with line after line of wit, insight and more layers than your aunty's wedding cake. The boy Russell can certainly write. Oscar-winningly good on celluloid, it's better on the stage, and this production doesn't disappoint. The venue might look and feel like a converted hotel function suite (which it is), but this is forgotten as soon as Rita bursts onto the stage in a jolting blur of colour and noise. The actress is near-perfect, the odd first-night slip easily overlooked as the vowels, pitch and timing take over. The actor playing Frank seems remarkably young to take on the role of an alcohol-soaked disillusioned middle-age lecturer with a stuttering career as a poet and a broken marriage behind him. “I wish you'd walked through that door 20 years ago” says Frank to Rita, at which point it's difficult not to notice that 20 years ago this Frank would have been in short trousers and school tie. Still, as problems go, that's minor. A production well worth missing the first couple of rounds of the pub quiz for, and your mum will love it. By some strange piece of synchronicity, the image of Liverpool’s great waterfront skyline has been haunting Scottish theatre in the week of the announcement that the city is to be European Capital of Culture in 2008. Hurry along to the Festival Theatre in Edinburgh, and there you’ll see it, hazy in daylight or outlined in stars, in the spectacular backdrop to the touring Bill Kenwright production of Blood Brothers. And up at the Byre in St Andrews, here it is again, spread like a decorative border all across the programme for Ken Alexander’s new production of Educating Rita. The man behind both shows, of course, is Liverpool’s leading dramatic bard Willy Russell, ladies’ hairdresser turned playwright, and extraordinary man of letters; and his work certainly offers plenty of food for thought about the challenges facing Liverpool writers in the run-up to 2008. It’s clear that part of the huge energy that inspired both the Glasgow and Liverpool bids to become European City of Culture comes from the impulse to give a voice to those who feel marginalised, discarded or abused by the onward march of history; to the people of big cities sucked into being by the economic whirlwind of the Industrial Revolution and then left on the scrapheap - and often mocked, insulted and stereotyped, too - in the second half of the 20th century. But the key question - one never quite resolved during Glasgow’s 1990 year in the limelight - is how to voice that experience, as Bill Bryden memorably did in his huge production of The Ship at Govan, without succumbing to self-pity, and the kind of blame-shifting victim-mentality that leaves people feeling not more powerful for having told their story, but less so. And in that sense, these two Willy Russell shows currently playing in Scotland offer some interesting contrasts, not only in style but in attitude to the people whose lives they describe. Blood Brothers - first seen in Liverpool in 1982, and reviewed here last week - remains a passionate, haunting and hugely popular modern tragedy, a big hit musical with a rare backbeat of strong, meaty drama and class politics. But its heroine, working-class mother-of-nine Mrs Johnstone, is portrayed throughout as a helpless victim of her fate, although an instantly recognisable and attractive one; she’s fearful, superstitious, self-deceiving and doomed to pay a terrible price for the one positive decision she ever makes. Russell’s great comedy Educating Rita, though, takes an entirely different approach. As Alexander’s excellent Byre production demonstrates, it’s one that gives the play a surprisingly contemporary edge, 23 years on from its first London production. The difference, of course, is that its protagonist Rita - a 26-year-old Liverpool hairdresser who has decided to branch out into an Open University course on English literature - comes from a working-class background but, like most real human beings, is not wholly defined by that class identity. For one thing, as Russell shrewdly observes, her life-chances are shaped by gender as much as class. Rita can take up her Open University course, and try to change her life, precisely because the Pill has given her the control over her own fertility that Mrs Johnstone lacked. And for another, Rita has the key human ability to think, argue and imagine her way into a thousand different worlds, and to offer a critique of the people and culture she comes from, as well as a passionate understanding of their problems. In one of her key speeches, Rita articulates her sense that these problems are not only economic, but cultural and spiritual, and that providing top-down jobs for people thrown onto the scrapheap is, at best, only a short-term solution; it’s a thought that might act as a mission statement for the whole 2008 project, designed as it is to work from the bottom up, to unleash the creativity of the people, and to help free them at last from that old sense of dependency and powerlessness. 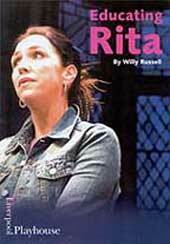 Up at St Andrews, Anita Vettesse and Richard Addison make a fine, passionate job of exploring the relationship between Rita and her disillusioned tutor Frank, capturing both the huge vitality of Rita’s language and persona, and her desperate need to transcend it. The production, staged on a gorgeous open-book set by Rebecca Minto, also raises some disturbing questions about what has happened, in the last two decades, to the shabbily tolerant academic world Russell portrays, and to the kind of liberal education that Rita experiences. 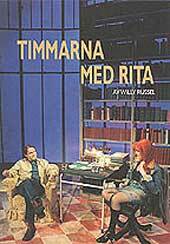 In that sense, as a political play, Educating Rita strikes an unusually mature balance between celebrating the power of individuals to take their fate into their own hands and recognising the structures - from the free availability of contraception to the presence of a liberal education system - that make that self-empowerment so much more possible. If Liverpool 2008, like Glasgow 1990, is to be partly about enriching the debate on what kind of society we need to be in the 21st century, then that fine balance at the heart of Russell’s most popular play seems to me as good a starting-place as any.